Having lived in Central Oregon for a couple of decades I have had plenty of time to search out and find some of the more unique treasures of the land. 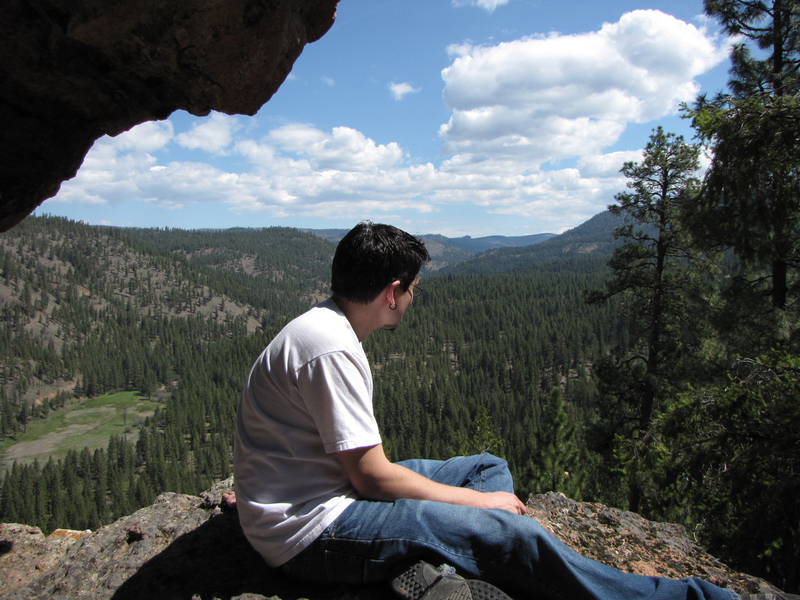 And, preferring to hike where the crowd seldom goes, I lean towards hikes in wilderness areas and areas heading away from the more ‘popular’ and frequently used Bend area trails. 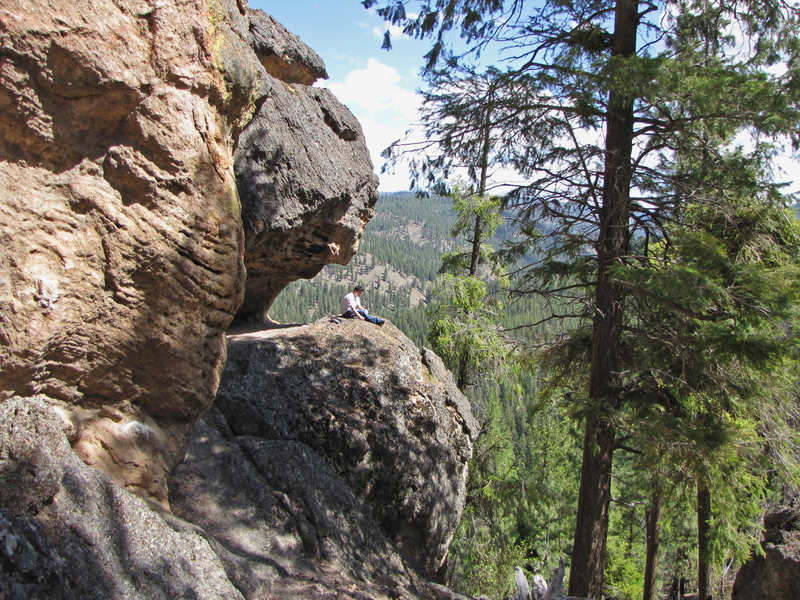 One particularly special hike for me is Steins Pillar Hiking Trail located in the Ochoco National Forest just outside of the Mill Creek Wilderness Area. On the map it reads at just under 4 miles round trip, but it actually feels like much more than that, perhaps due to the fact that the hike out is very nearly all up-hill, and even more so if you commit yourself to hiking down to the base of the pillar at the far end of the trail. Whew! 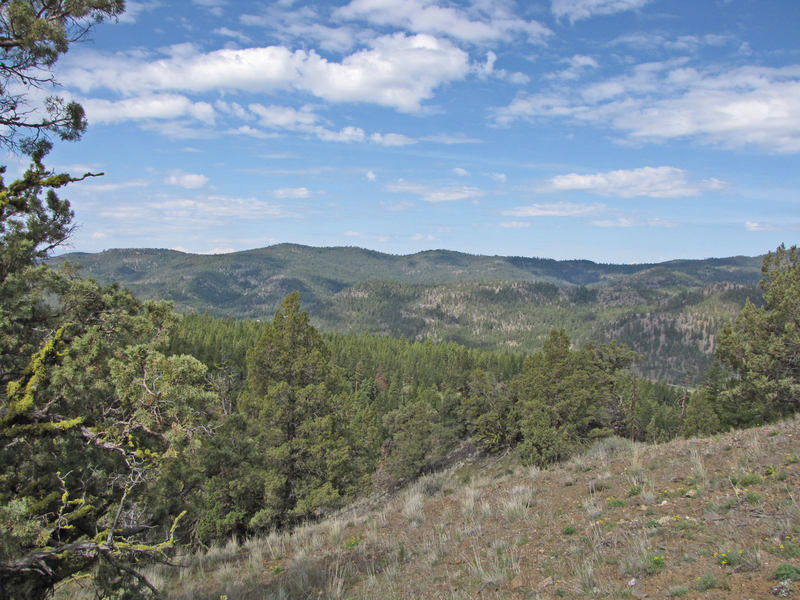 Finding the trailhead is pretty easy; it is 9 miles east of Prineville on Hwy 26. Just as you pass Ochoco Reservoir the Mill Creek turnoff with take you left following the creek for about 6.5 miles, about 2/3 of that road is paved. Although the Forest Road (#3300-500) turnoff to the pillar is fairly well marked I must warn you to keep an eye out for the turnoff. If you’re busy chatting or if you get distracted by the beauty of the landscape, you just might miss it. If you get to the Steins Pillar viewing pullout, you’ve gone too far. The forest road to the trailhead is all uphill and it’s very curvy, one lane in many spots. The parking area is better marked than it used to be, and it’s not uncommon to see a car or two in the turnaround. The trail is well defined and easy to follow although there must have been some really horrible windstorms since I last hiked this trail, as there are a number of (huge) old dead trees that have fallen over all along the way. Some of these old behemoths served as landmarks on earlier treks and I felt a little sad to see they have toppled; several have fallen across the trail making it tricky to get around in spots. 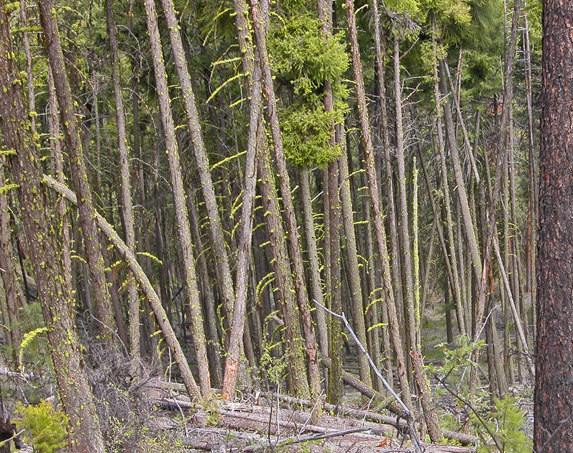 And, speaking of downed trees, this area of the Ochocos is rather messy with Lodgepole pines littering the forest floor quite heavily in spots, which makes you wonder what might happen if the place caught on fire before they have a change to rehabilitate the Ochoco National Forest – or, if they ever will. Steins Pillar hiking trail is spectacularly beautiful regardless of the condition of some sections of the forest that the trail passes through. It is complete with panoramic views of the surrounding wilderness areas, unique rocky outcroppings, naturescapes galore and loads of wild critters. The trail starts out in a deep Ponderosa pine forest and climbs up into a more arid high desert landscape, then the trail meanders around and through several other unique micro climates along the way until you get to the pillar at the end of the trail. Before you actually get to the pillar though, you will pass by a couple of minor rock formations, but don’t be fooled into thinking this is the famous Steins Pillar, you’ll recognize it when you get there. Some people opt to complete this hike at the level portion of the end of the trail, but all of us who can still handle a few flights of stairs really should hike down to the base of the pillar. You don’t get a full appreciation for the height of Steins Pillar unless you can get up close to it, and the trail down to the bottom will bring you right up to within hugging distance of the megalith. 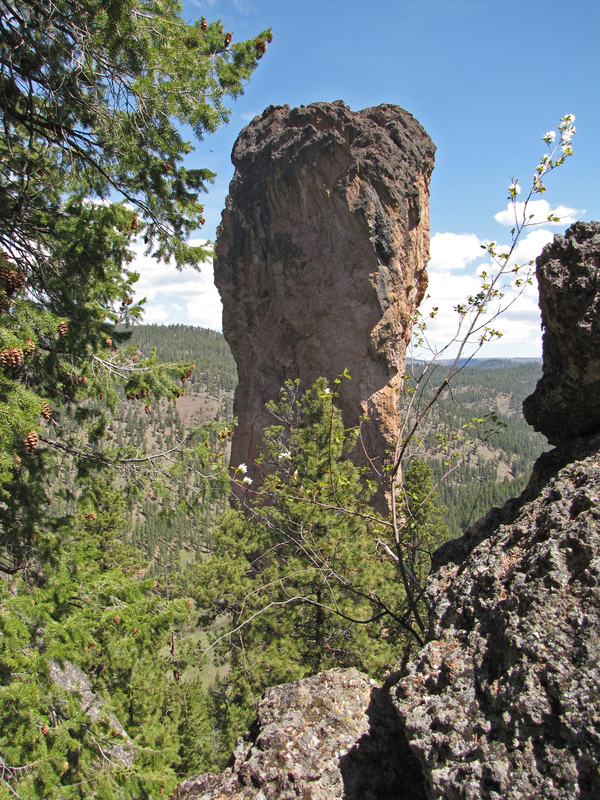 There is a cavern at the base of the pillar that offers some really spectacular views of the Mill Creek Wilderness area, and if you have your binoculars along, you’ll be able to spy the Twin Pillars at the far end of the valley. Pack a lunch if you go mid-day because this is the perfect place for a picnic. Besides, you’ll want to take some time to rest and restore before heading back up those stairs, and from there it’s uphill, though not straight uphill, but uphill nonetheless – all the way back to the trailhead. What you’ll see: a few hikers – frequently in groups, some hiker-dogs, lots of birds, lizards and an occasional snake as well as butterflies in their season and a few dragonflies. Since it was early in the season when we went this last time, we passed through a couple of small clouds of mosquitoes, so you might prepare for that. Pack water, a leash and a lunch.